Throughout Black History Month, The Visionairi Foundation in conjunction with the Black Alumni Society will host incARceraTed: Art Transforming Lives. This series of events focused on the arts, criminal justice, and life transformation, will engage the Northwest Arkansas community on issues of mass incarceration and criminal justice reform, capital punishment, entrepreneurship, and hope. The first event will be held on February 4th at 6:30 pm in the Arkansas Student Union room 507-508. 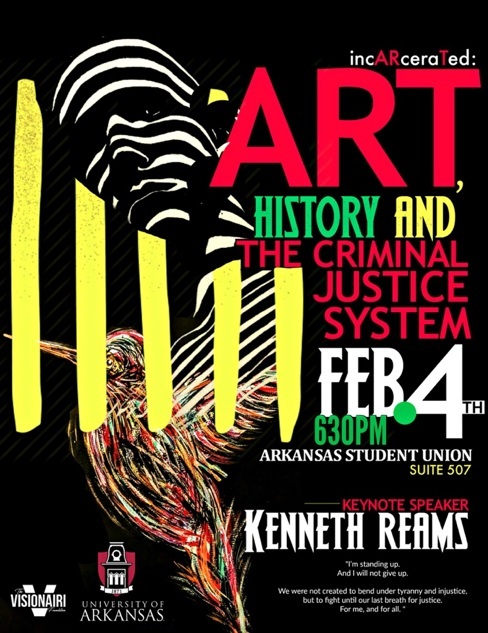 The University of Arkansas Black Students Association, Students of Retailing Excellence, and the National Association of Black Accountants will kick-off Black History Month with a panel discussion featuring special guest artist, Kenneth Reams, Arkansas Department of Corrections Death Row Inmate. In 1993, at the age of 18, Reams, a native of Pine Bluff, became one of the youngest people to be sentenced to execution in Arkansas history. Using art, Kenneth has literally fought to save his life while creating a new future, receiving accolades and conducting speaking engagements at institutions, and exhibits around the world.